The € Pepper Spray - Your personal Bodyguard for quick Self-Defense. Free Shipping to EU countries! In this Shop you find a wide range of (Dog Repellent) Pepper Sprays to buy for self-defense against vicious Animals. Self defence spray has become more and more popular in Europe. The spray cans are usually small and can be carried in a jacket or bag for your own safety. Women feel more secure with self-defence spray as it gives them a sense of security when they are going out on their own, especially during the night. 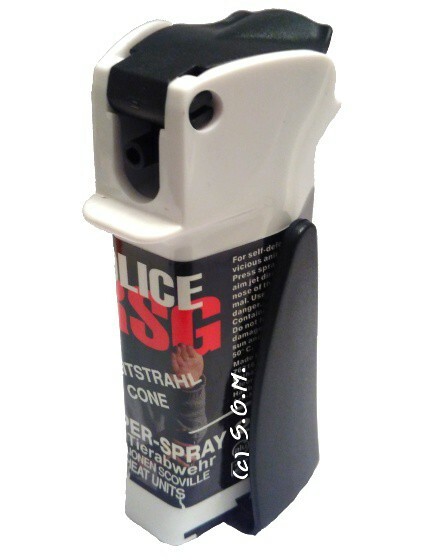 A self-defence spray is easy to handle and can be obtained legally, if it's used during an attack the attacker will not be able to see for a few minutes, the spray also causes a rash and gives the attacked a chance to run away or find a safer place to inform the police or seek further help. The spray is a welcome tool to defend yourself and Europeans use it to their advantage when they feel threatened. It can also be used against an attacking animal and it leaves no permanent damage. The prices for self-defence sprays are reasonable so everybody can afford one and feel safer while being out on the street. The spray can is easy to hide in a jacket and can be used like any other spray by simply pressing the button and spraying the content into the attacker's eyes, making the opponent immovable. Therefore, self-defence spray is a welcome alternative in order to feel more secure. Take care with reglements and laws in your country. Please inform yourself at your responsible authorities in advance, which products from our range of goods you may possess (indoor / outdoor) / use (with licence) in your country. ● The new "Anti Dog Defence Spray with Pepper" starting from 3,95 EUR up! ● The Pepper Spray is your personal bodyguard for critical situationes. Our cans are clearly labeled as "Anti-Dog" or Contra Dog Sprays. We sell Anti Dog Pepper Sprays only. Our pepper sprays have no "also against human" label. The cans contain Oleoresin Capsicum from the chili plant, which means the technical knock-out even for the most aggressive dog. 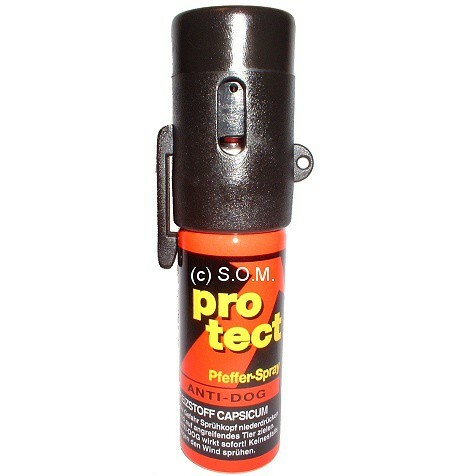 Pepper Spray – the ideal equipment for your self-protection. And btw. Pepper Sprays ingredients are environmentally harmless and biodegradable. The active pepper ingredient is also used in very hot dishes. 1. We send the goods ordered in 72 hours after we have received your payment. 3. All orders will be delivered in a neutral packet. 4. We can't see your card details. 100% Discretion for buyers. 5. Euro Countries only. Shipping from EU Country to EU country is safe. Status of your Order? - Problems with the Website? eMail us!